Julia Franks has roots in the Appalachian Mountains and has spent years kayaking the rivers and creeks of Tennessee, North Carolina, and West Virginia. She lives in Atlanta, Georgia, where she teaches literature and runs loosecanon.com, a web service that fosters free-choice reading in the classroom. 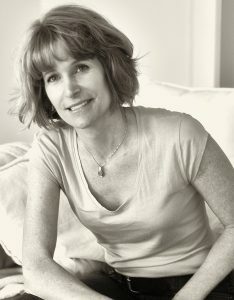 Over The Plain Houses is Julia’s debut novel, for which she has won the 2017 Thomas Wolfe Memorial Literary Award, the 2017 Georgia Author of the Year Award in Literary Fiction, the 2016 Southern Book Prize, and a Gold Independent Book Publishers Award (IPPY) in Literary Fiction. It’s 1939, and the Federal Government has sent Virginia Furman—USDA agent and thoroughly modern woman—into the North Carolina mountains. Her mission: to ease hard-living rural homemakers into the twentieth century. It’s here, amongst the bonnets and home-bakes, that Virginia meets Irenie, the shy and shuffling wife of a local preacher. It’s a dangerous friendship for the women to pursue. Irenie’s husband, Brodis—threatened by modernity—has been acting strangely, his peculiar brand of fundamentalism warping into survivalist hellfire. Fearing his touch, Irenie starts to ramble at night through the woods, storing strange keepsakes in a mountain crevice and sneaking back into bed with supernatural stealth . . . unaware, all the while, that she’s being stalked by the Bible-haunted man who fears his government and is staking his integrity upon an older way of life. Convinced that Irenie is consorting with the devil, Brodis brings about an act of violence that shakes his entire community, while his strained marriage threatens to explode.